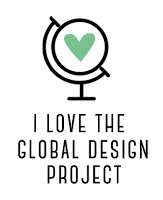 Today I have got a more unusual project for you. I have made a triangular shaped gift box for some small jar candles that I am going to sell at my next craft fair. 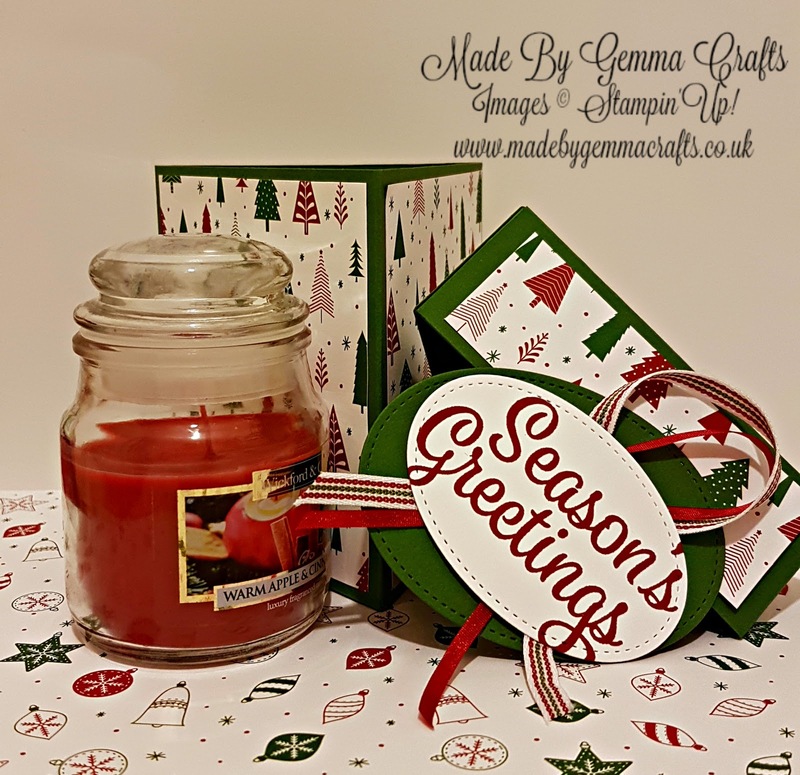 Christmas is now fast approaching with only 84 days to go, so we crafty folk need to get organised, I am going to have a few more Christmas projects for you over the coming weeks. These would make a great teacher thank you or neighbour gift. 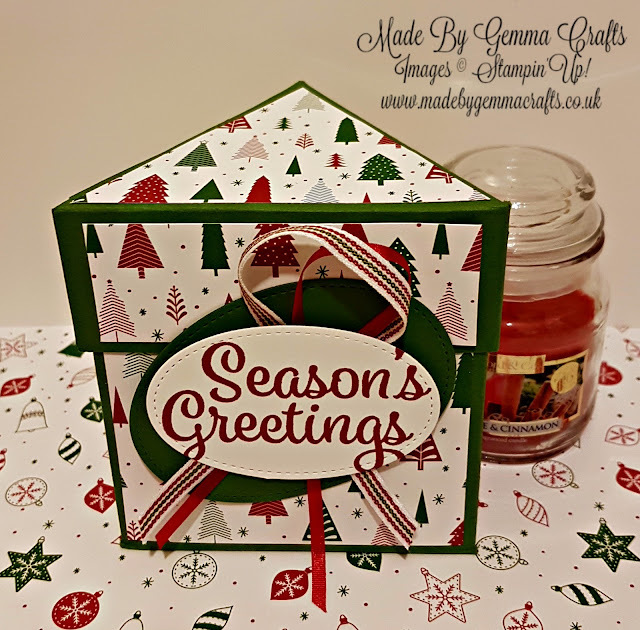 For my box I have used Garden Green cardstock and decorated it with the Be Merry Designer Series Paper (which is in the DSP sale) and the stamped sentiment comes from the Snowflakes Sentiments stamps set which is fast becoming my go to Christmas stamp set! Teamed with the ribbons that are in the Holiday Catalogue are 2 of the Stitched Shapes Framlit oval diecuts. When I was making the box I decided to attach the sentiment tag to the lid of the box as it looked better than on the base and it's just a little different and sometimes different is good! For the lid, Cardstock measuring 4 3/4" x 11 1/2 and a small piece measuring 1 1/2" x 3 1/2"
3 pieces of 3 3/4" x 3 1/2"
3 3/4", 7 1/2", 11 1/4"
For the lid, Cardstock 4 3/4" x 11 1/2"
Now score the small rectangle of cardstock along the long side (3 1/2") at 1 3/4"
Here is the video tutorial for the box where I show you how to assemble and decorate you box. Thanks Gemma. another great idea, love this box easy to follow information. Thank you for this great tutorial. I plan on making a birthday box for a friend using this. Kay G. luv the way you made the bottom of the box, I made two covers and adhered the bottom one but like your way much better, thanks for sharing.